Corby Town could hit an impressive milestone in their Evo-Stik League South Division One Central season on Saturday. The two goals they scored in last weekend’s 2-1 victory at Aylesbury United took the Steelmen on to 99 in just 34 matches. They will now be hoping to break through the 100 mark when they take on Welwyn Garden City at Steel Park this weekend. And boss Steve Kinninburgh believes his team’s attacking approach has played a key role in the return of the feelgood factor at the club this season. 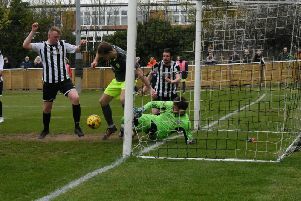 “It’s a 38-game league season and it’s not the norm for a non-League campaign, you are usually looking at 42 or maybe 46 matches,” said Kinniburgh, whose team will get their shot at promotion in the play-offs at the beginning of next month. “So the fact that we look like we are going to score over 100 league goals is quite an achievement. “But it is what we set our stall out to do. “Right from the start, we wanted to focus on our attacking play and I think the fans have enjoyed it. The average home attendance is up and there has been a feelgood factor around the club. “All these things come hand in hand with the way we play. We like to have a lot of attacking players on the pitch and I think we have provided a lot of entertainment and enjoyment."